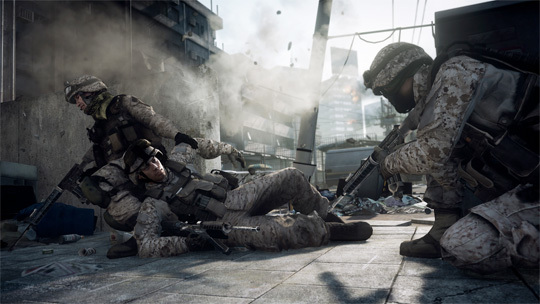 EA's Battlefield 3 has caused quite a stir: stunning gameplay, jaw-dropping trailers and a never-ending spat with Activision's Modern Warfare 3 has placed the game at the top of many people's wish-lists as one of the most-anticipated releases this year. Unfortunately, EA shot itself in the foot this weekend with the announcement that customers who pre-order the game will receive exclusive weapons and equipment that gives them an edge over folk who wait until the game is actually out before buying it. Developer Dice is said to be far from happy about it, and the games fans are more than outraged. At the time of writing, 94 per cent of folk posting comments on the EA forum say it's a bad idea. There is even talk of fans boycotting the franchise until the situation is rectified. A thread over at Reddit.com is calling for fans to "Vote with their wallet" and send emails to EA in complaint. The response has been massive. A few years ago, EA tried something similar with Bad Company. The community vented its annoyance and the outfit soon backtracked on the decision.